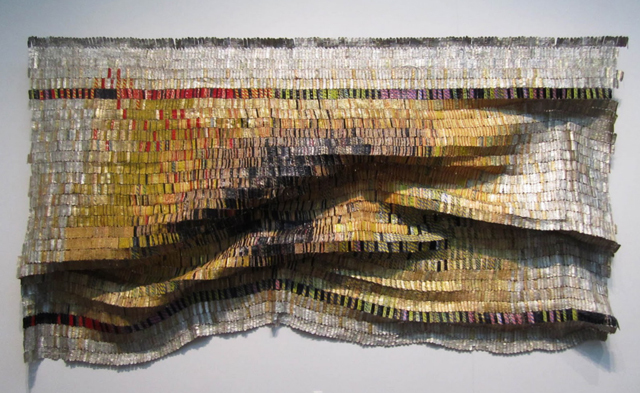 On a recent trip to New York, my friend Alana introduced me to the amazing work of renown artist El Anatsui. Expressive and elegant, the mix of colors and textures of his opulent wall hangings capture the imagination of the spectator. From afar, they remind us of fish scales glimmering in the sun, of Gustav Klimt’s ornate paintings or Seurat’s pointilism — up close, mundane objects permanently transform our expectations about what art is and where it comes from. 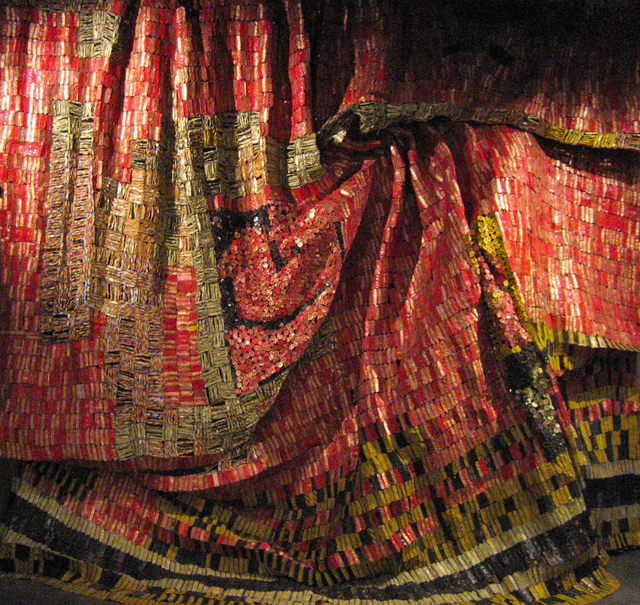 El Anatsui was born in Ghana in 1944, when it was still the British colony of the Gold Coast. After studying at a local art school — where the curriculum was mostly Western — he felt the need to learn more about local traditions and began studying African ideographs, later becoming part of a movement that promoted a sort of open-minded traditionalism. 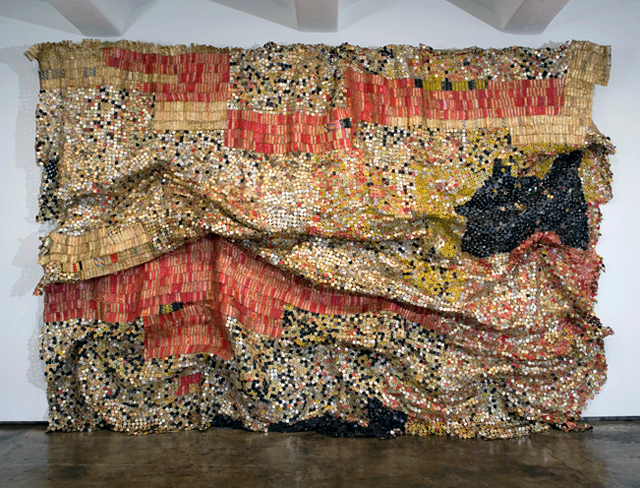 El Anatsui has spent most of his adult life working in Nigeria, emerging from the vibrant post-independence art movements of 1960s and 70s West Africa. 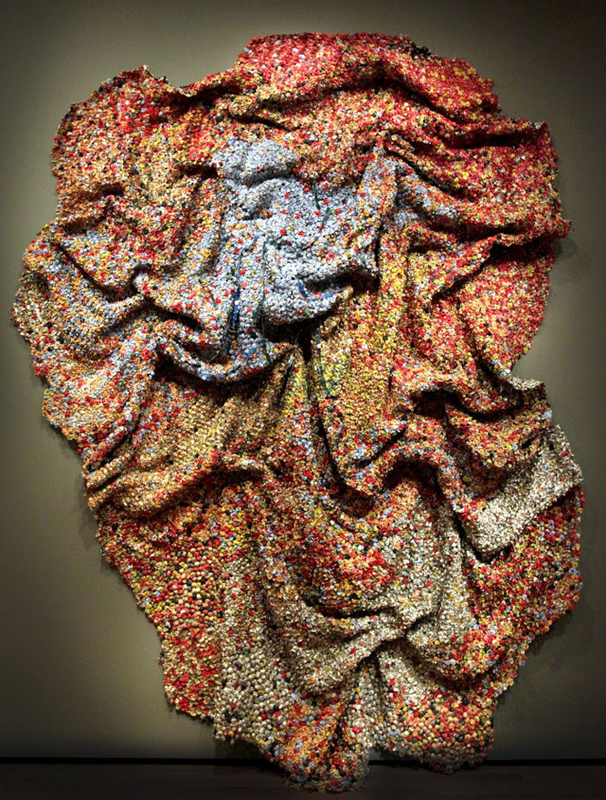 His sculptures / wall hangings are vibrant and experimental in their mix of media, form and tradition. 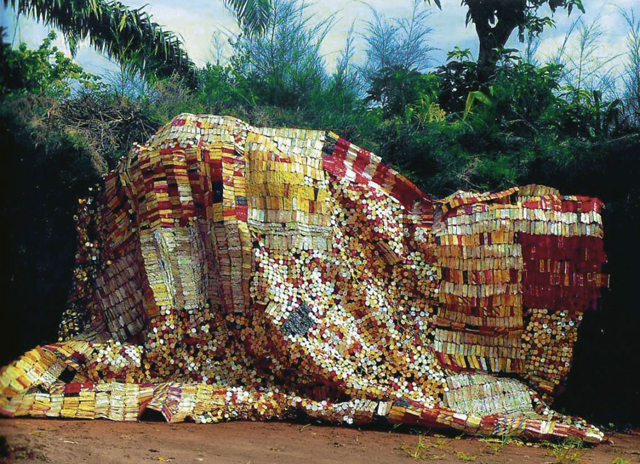 It all began one day ten years ago, when El Anatsui drove by a bag of rubbish in the countryside. Although not an unusual sight in southern Nigeria, that particular bag of rubbish looked promising, and so he took it to his studio where it lay waiting for his inspiration. 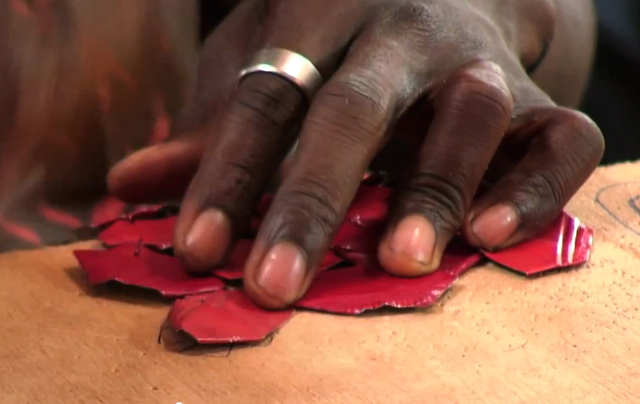 In the meantime, he kept developing other kinds of art work in wood and clay, always experimenting with materials that are meaningful in the context of the local culture and which explore the relationship between the part and the parcel. Inside the bag were numerous discarded aluminum screw-tops from bottles of whiskey, rum and gin. 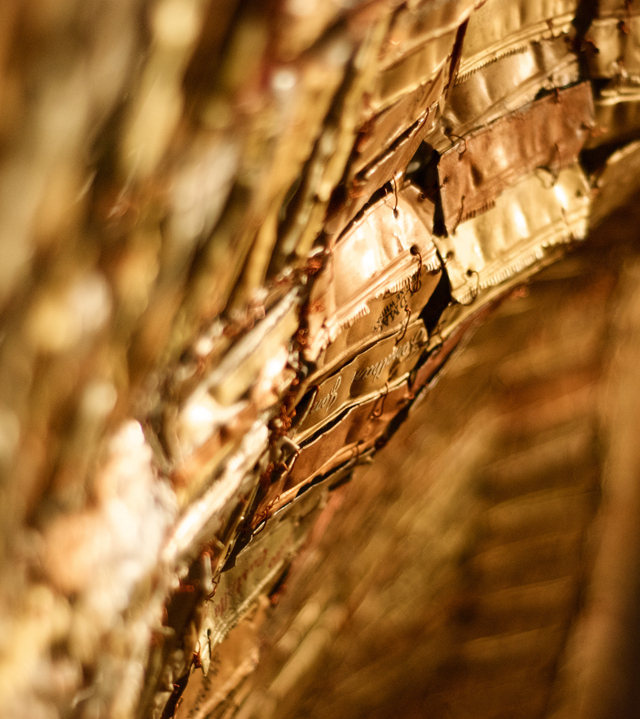 Eventually, the artist began experimenting with the materials he had found that quiet sunny afternoon — cutting and folding their pliable metal into flat swatches, and then stitching these together with copper wire. The result, as it grew, began to resemble fabric, a coarse, jangly metal cloth. 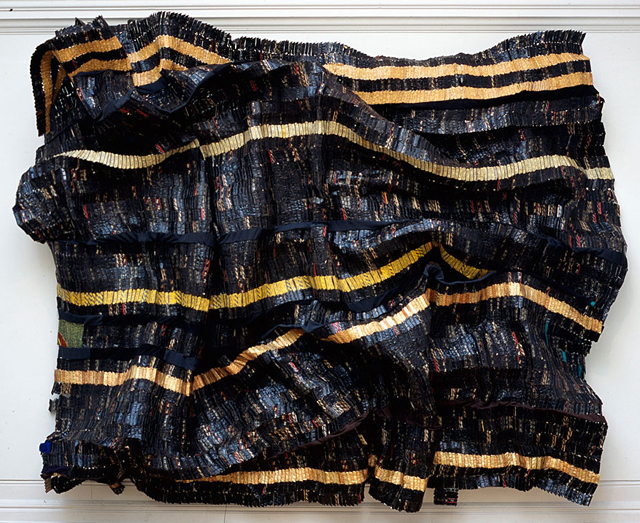 Anatsui elegantly combines history and craft — creating a category of art on its own — where minimalist Post-Modern and Pop intersect with tradition and the re-purposing of materials. 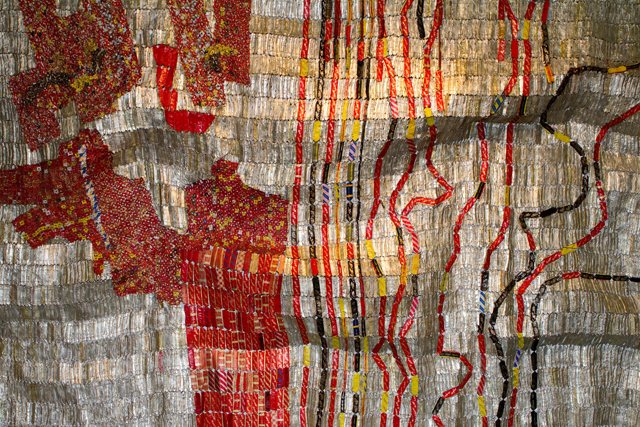 Anatsui has his studio in a small warehouse near Nsukka, which has been transformed into a virtual factory. 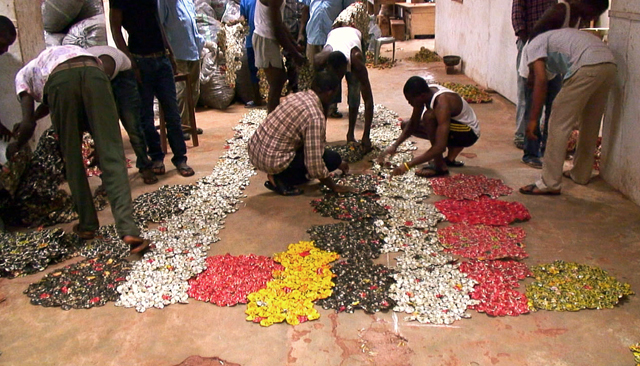 He no longer collects the discarded bottle caps and condensed milk tin cans, but instead buys them in bulk from local distilleries. He has a team of over a dozen assistants, most of them young men in their early 20s, working six days a week cutting and folding the aluminum pieces, which they then join into blocks. When the blocks are ready, Anatsui has his assistants lay out the pieces on the cement floor and begins to compose a new sculpture. He has them arrange the pieces until he is happy with the results, at which point they are wired together and the final piece is folded up like a blanket. 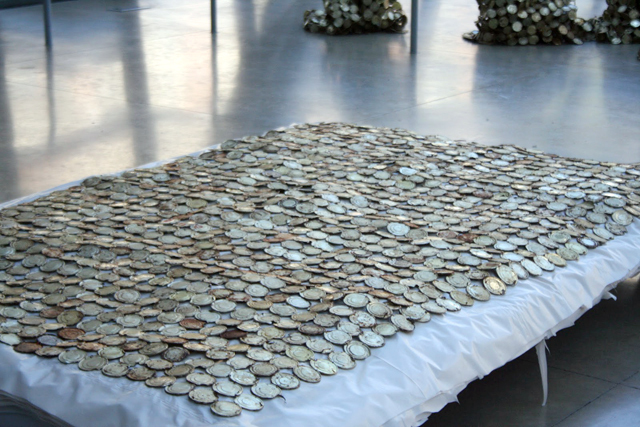 The pieces are malleable, each one having the ability to take on a different form with each installation. 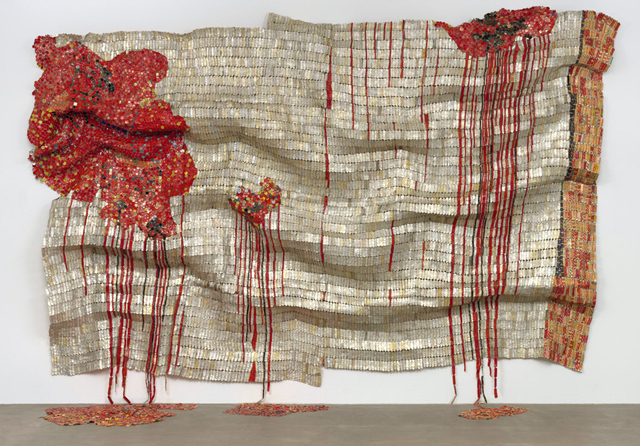 The provisional, shifting shape of El Anatsui’s work is one of the sources of its originality. Although he does not drape the hangings himself he prefers horizontal ripples to vertical ones, but leaves the final installation to each individual gallery and museum. In 2007, his pieces appeared at the Venice Biennale, where he immediately captured the attention and awe of the public, as well as of many of the world’s renown art collectors and Art Museums. 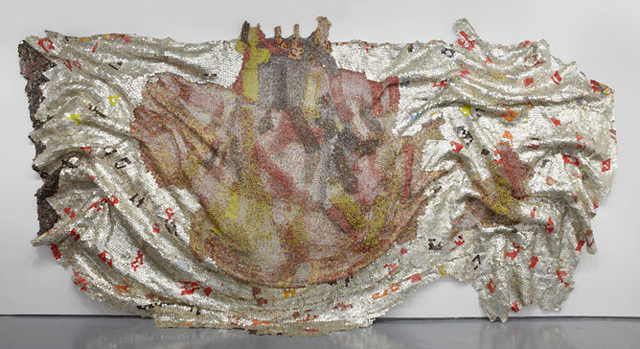 When I first saw El Anatsui’s work, it reminded me of the grand and laborious 15th Century Devonshire hunting tapestries made in France for the Countess of Shrewsbury. The enormous wall hangings, made with woven wool, engulf the spectator in various kinds of hunting scenes. 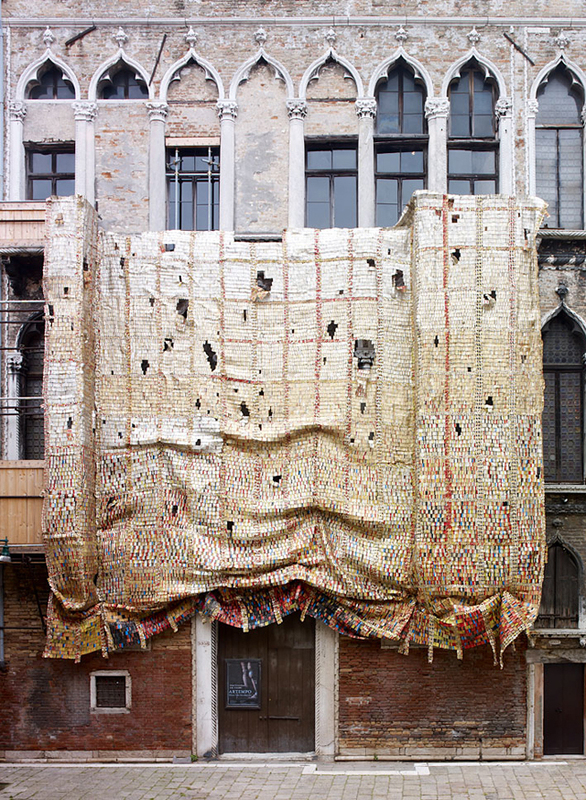 A parallelism could be made between the Medieval tapestries and El Anatsui’s grand pieces, as they both portray mundane aspects of their own cultures through indigenous crafts, elevating it to an awe-inspiring level. 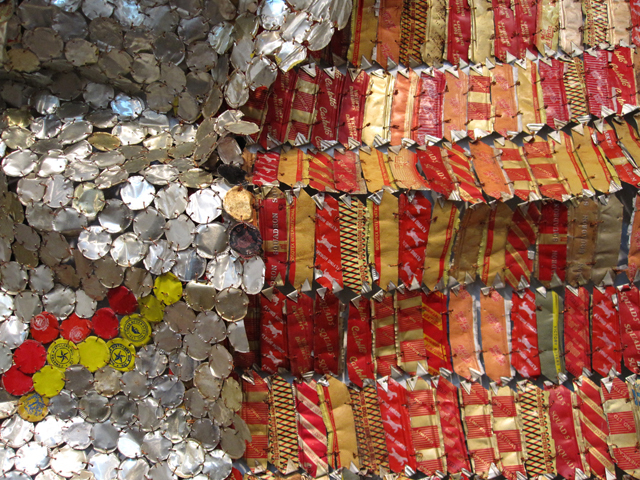 El Anatsui’s work inspires admiration to those who see it. It might be the simple and unassuming raw materials — which can be found in your local trash bin — and which belie the sheer grandness of the cloths (they measure over 20 feet wide and high in many cases). It is surely also the elegant and refined chromatic combinations and graphic designs that give each sculpture its own personality, as if each piece defined a different mood in the artist (or the spectator’s) life. It is clear that we are before an artist who has taken inspiration and resources from the past and from around him, and who will surely continue to amaze us with the gravity and grace of his pieces. This entry was posted in Uncategorized and tagged africa, art, artisan, binichic, design, inspiration, recycled, sculpture, textile, wabi sabi. Bookmark the permalink.